Last Thursday, I headed back to my old stomping grounds just outside Houston to visit my friends. 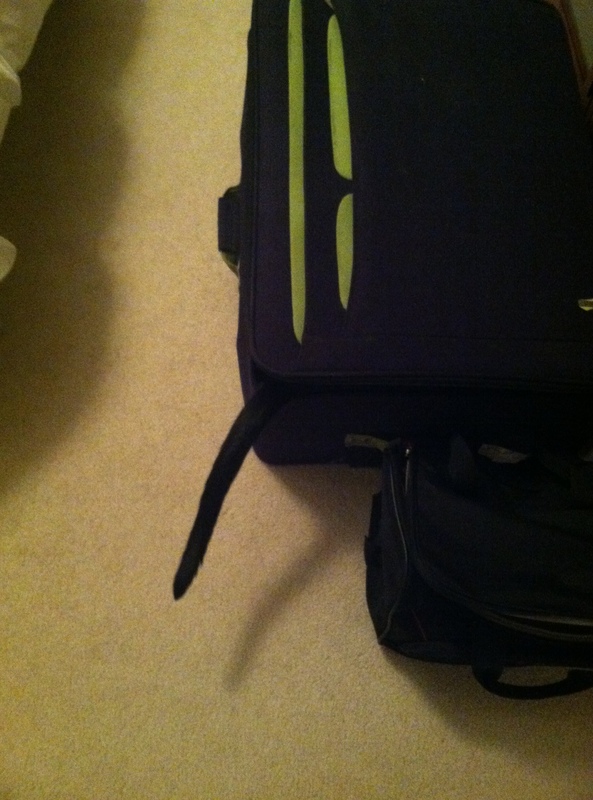 Had to be sure I checked my bags before I closed them for good. Anyone else ever find this when they go away? Someone wants to go with me! 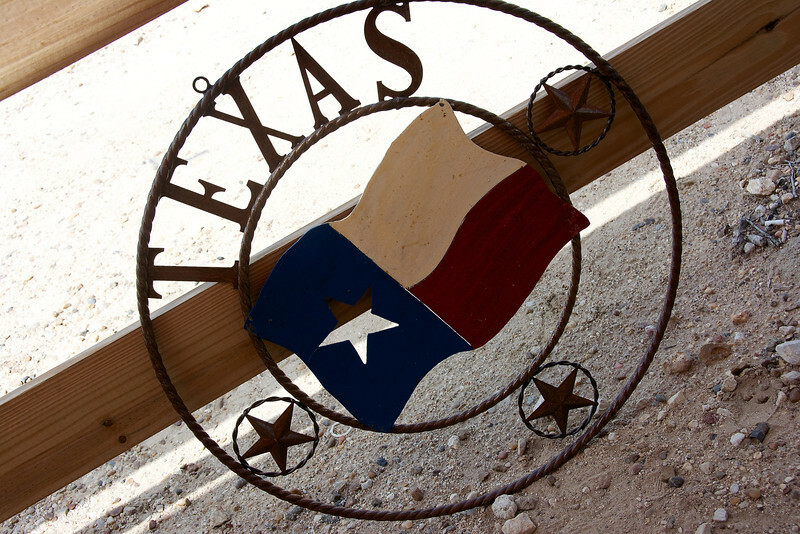 Living in southern Texas is hot, or at least warm, about 95% of the time. Except for this year and especially my first night there. All the people were “excited” over the possibility of an ice storm and snow and all that brings when things like that only happen every few years. All I could think about was getting my run in before the rain and temps dropped!! As soon as we got to Nichole’s house, I got out my running garb and took off for my 7 miler with 3 miles of pick-ups. It felt pretty good and I was happy to finish just as the cold rain picked up. Originally, the plan was to do the “beer run” in town, which is an informal run of however long you want and then socialize while drinking beer, then order pizza from my absolute favoritest pizza place evah, Grimaldi’s. Unfortunately, the weather deteriorated so much that only one crazy runner was out, but we went for the pizza and beer anyway. Score one for me. I am quite a pizza snob, so had been dreaming of this pizza for about a month. It did not disappoint and I got a big enough pie that I could eat off it for a few days. Mmmmm, good stuff. That night and into the next day, it rained and the rain froze, so my friend and I sat in front of her fireplace and chatted for what seemed like hours. Thank goodness that was my day off, so I didn’t have to worry about running in the icy cold. This is what we did to entertain ourselves. 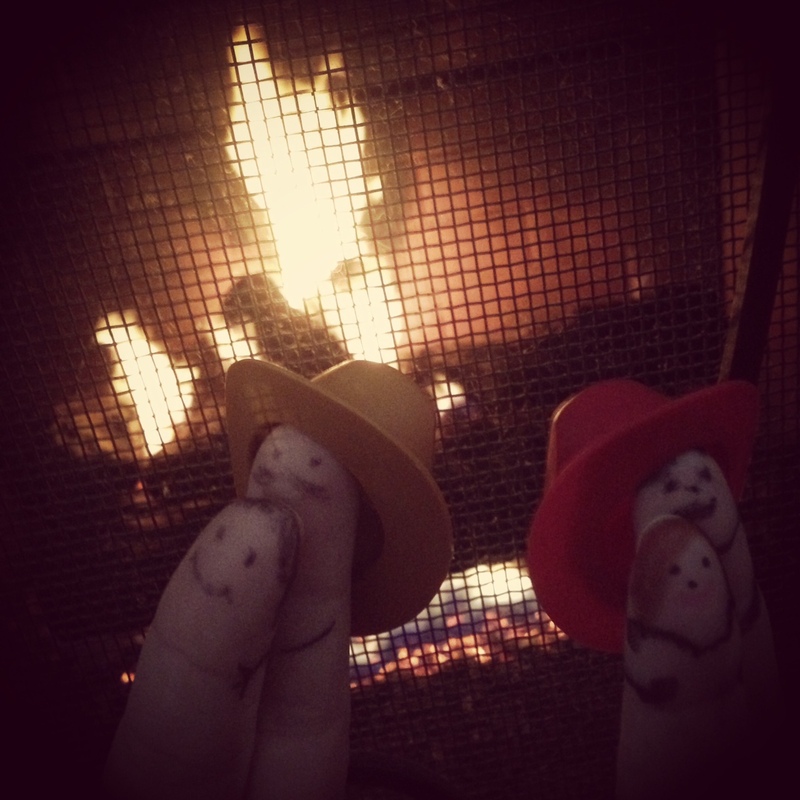 Finger people couples- oh yes we did! That night, we went out for more drinks with more friends and stayed at a dance club that had enough second-hand smoke to give emphysema to the entire city of Houston until 1:30 am. Cough. But it was fun and I got to do the Wobble. Bonus. On Saturday, I got my 5 mile easy run in and then went to the best social event in, well, almost everywhere, the No Label Brewery tasting. Five bucks for four pints of good beer. A bunch of people I knew were going to meet us there, so we socialized, drank our pints, and had a great time. It was so good to be outside in the warm sun surrounded by friends having a cold one. I realized that I was not in my twenties later that day when I just got reeeaaalllyyyy tired. I stayed at another friends’ house and when we were at dinner, I felt reeeeaaalllyyyy old. I just wanted to go to bed. So when we got back from dinner, I did just that. My long run that included a 5k race was on Sunday, so I wanted to be prepared for that. Sunday was a beautiful morning. I wish I would’ve taken my phone with me so I could’ve gotten a picture of the steam rising over the waters in the bayou in George Bush Park. Just gorgeous. It was a cool, crisp start to what was going to be a really nice warm day, for January anyway. My goal for the 5k was to crush it, but as normal for me, my warm up felt a little sluggish and I didn’t put too many expectations on my performance. It’s a pretty small 5k, but it’s a really cool concept. It’s free (you can make donations), and the point is to just get people out and active. They’ve grown from 50 or so runners to a few hundred with chip timing too, so it was fun to participate. I had PR’d on that course the year before while training for Houston, so I wanted to again. When it started, I took off and ran a bit before looking at my watch. I thought I was going close to my goal pace of 7:00 minute mile, but saw I was actually going about 6:30-ish. Yeah! Mile 2, as expected, was a little harder and I know I slowed down a bit. I was passed by a lady who was older than me, but she had the most amazing stride. I wish I looked like her when I ran! I knew there was no way I could catch up to her, so I let my competitive urge go. Then a little later, she was stopped off to the side of the course – boo. I like to win my age group and things like that, but I do not like to see other athletes pulled up at the side. Near the finish of the 5k. I was getting tired when mile 2 hit, but I knew that I would regret not giving the race my all, so I kicked it back into gear. I cannot for the life of me do any sort of math during that kind of run, so I just waited until the end to see where I was regarding the PR. My watch time was 21:15 (chip time was 21:13!! ), so I was absolutely thrilled to race that well and PR by about 37 seconds. The race is pretty small, so I ended up with first overall female, which was pretty cool. I saw some familiar faces, gave a few hugs, and then headed out to finish the rest of my run that included two more miles of pick-ups. Gasp. I got ‘er done and headed back to hang with my friends. What a good weekend. The timing was good with coming in before their ice and getting back before ours. I got to socialize with my friends, drink a little beer, and do my running that included a PR. I’m actually liking 5k races a lot more and find the challenge to be a good one. I am now making a sub-21:00 5k my goal. So the marathon training continues here at home with a wacky schedule due to our “snowpacalypse” coming. I did get my 7 miles in today and tomorrow’s swim will depend on if the Y is open for business. School was closed today and tomorrow and possibly Thursday (appears that the kids will be going to school until friggin’ July), but we will see what actually happens. We’re all stocked up on our food, drinks, so bring it on, Mother Nature!! As you know, I like lists. So in the spirit of Thanksgiving, I decided to make a list of ten things I’m thankful for. 1) All the obligatory things that most of us are thankful for. My family, my kids, my health, my sense of humor, my husband’s company, my house, running water, grocery stores, a few bucks in the bank, the birds, leaves, waves of the ocean, and well, I could go on and on. There’s not a day that goes by that I know I’m lucky, I’m thankful, I’m appreciative of these things in my life. 2) Lists. I’ve mentioned this before, but what other little thing can give you such a sense of foreboding of all the things to be done, organization of said things, and then a sense of accomplishment when you can put a nice little line through each thing you’ve either put in your grocery cart or completed? Could you imagine the grocery stores if we didn’t have lists? I would still be wandering around the grocery store wondering what I needed for our Thanksgiving meal, then returning about a hundred times because I’d keep forgetting what ELSE I needed…. and I don’t know how I would have gotten through listing our Texas house for sale with out multiple lists. Lists are a wonderful thing. 3) My husband, Andy. He’s my biggest athletic supporter, my jock. He pushes me to follow my dreams, supports all the work along the way, and yet, doesn’t post videos on YouTube of me doing the Wobble in the kitchen. He lent his shoulder to me after my attempts at Boston failed, he danced around with me when I made Boston. 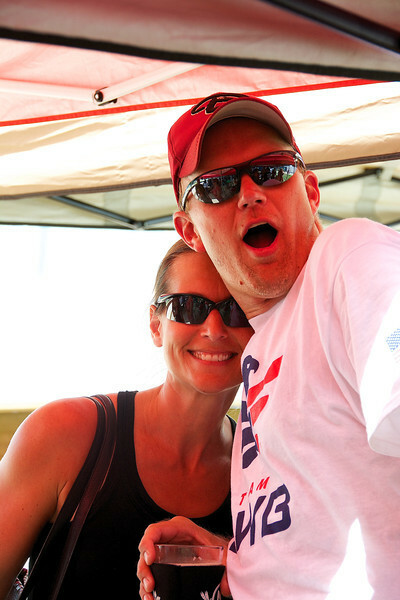 He is my sherpa, photographer at the end of races, my driver when I’m tired. He calmly listens to me when I perk up and say, “Honey, I have an IDEA!”. He doesn’t judge me when I have one too many glasses of whine wine. I’m a roller coaster, and he’s the calm, the even one, the rock. Love you, R. Andrew. 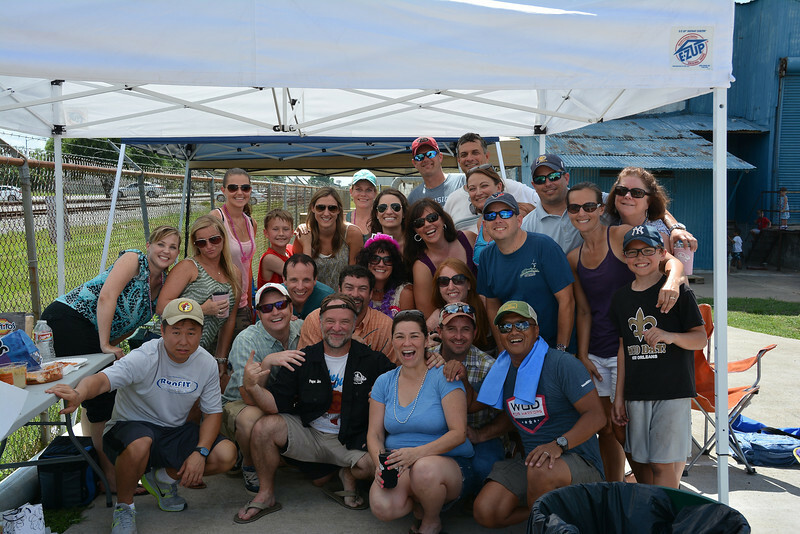 4) Coach Alain and the Gotta Run running group in Katy, Texas (a town near Houston where I lived until a few months ago). It’s hard to imagine not accomplishing your goals when you have someone constantly telling you that you can. I don’t know how many times I second guessed my goals while training for the 2013 Houston Marathon. But when you have someone look you in the face, put his hand on your shoulder and tell you, “You got this”, it’s hard to not go get it. 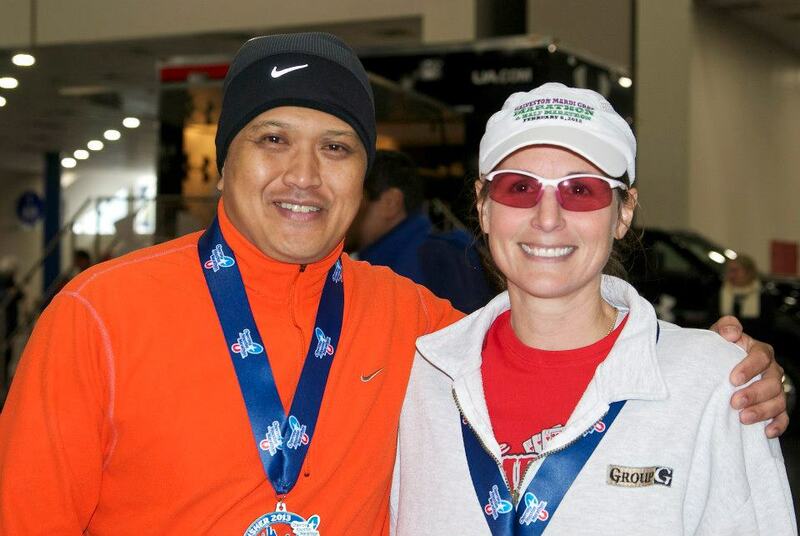 Coach Alain and me after the Houston Marathon. A gift from my Texas peeps that is now in my back yard in NC. 5) Coach Kristen. Now this is interesting. 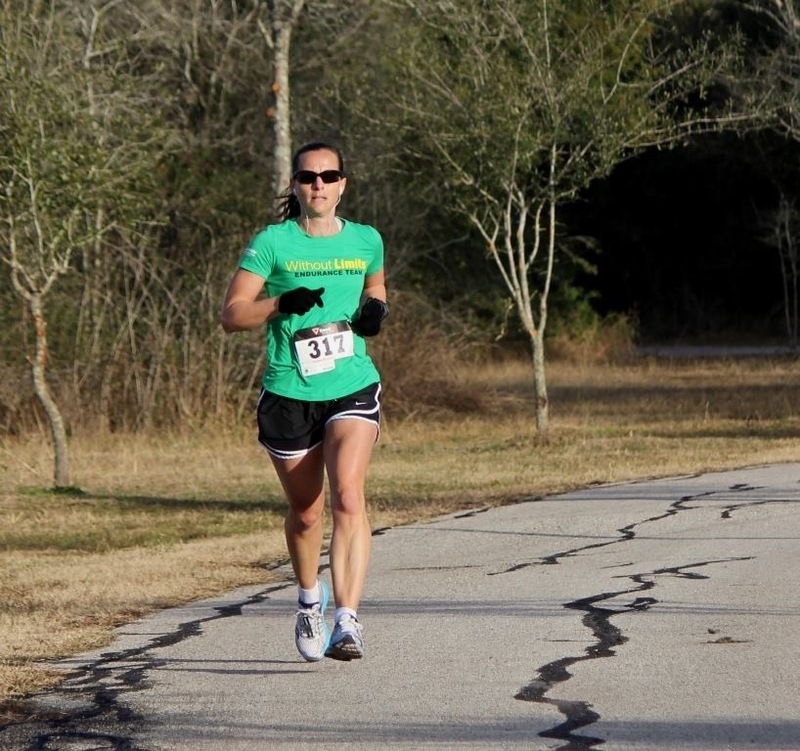 Had it not been for Kristen, my current coach in NC, traveling to Houston in 2012, I would have never joined a running group. Talk about irony…. Kristen was my sister’s coach and came to Houston to run the 1/2 marathon and wanted someone to pace her. I ran 5 miles with her (there was no pacing done, Kristen ran like a rock star) and when I saw all the amazing support the Without Limits crew gave to each other, I knew I wanted to be part of a team. So three days later, I joined the above mentioned Gotta Run group. When we moved to NC, Kristen became my awesome coach, the one who listened to me whine and moan and groan about shin splints and all that had to offer, the one who constantly tweaked my training plan to adjust for my injury, the one who has given me such good advice to make me a better athlete, the one who will train me to be the fastest marathon runner I can be, plus a triathlete. She’s teaching me patience too, although she may not know that the jig is up – I’m on to her. Thanks Kristen, you effing rock. Seriously, I am so thankful for you. 6) Energy Drinks. When you’re driving millions of miles (ok, it FELT like a million miles!) across the country and you’re tired and worn out and stressed, you need to stay awake, right? Same goes for getting up early to train and then spending a hundred hours watching your kids at football practice. Drinking coffee would only make a 10 hour trip into a 15 hour trip due to constant pee stops so I found energy drinks. 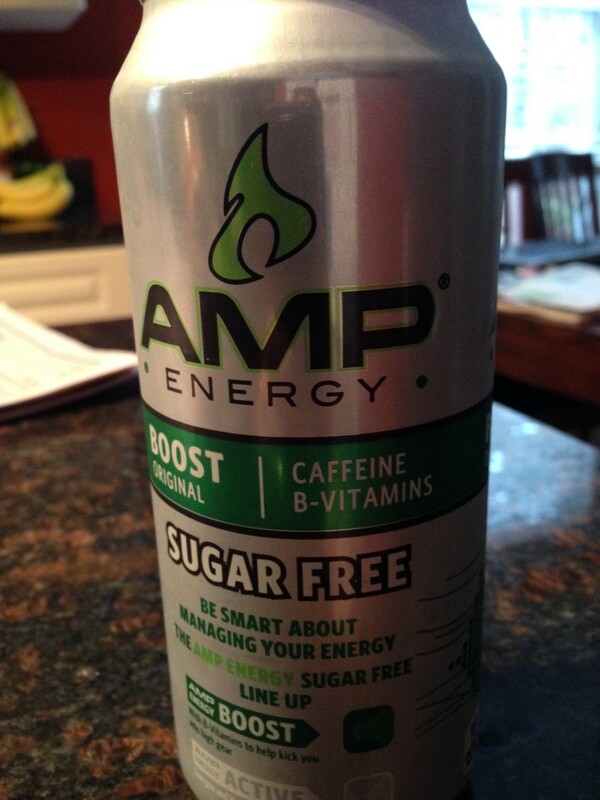 Sugar Free Red Bull is my favorite but I found Amp is just about as good, plus it has “vitamins” in it. When I’m exhausted and can’t get a power nap in, which is most of the time, I’ll grab one of these and then a short time later, GAME ON. I also realized I cannot have this after 5 pm or it’s GAME ON until midnight. I believe someone will discover this is the real source of super powers. 7) Music. Music can take me to a time and place in an instant and distract me from anything that’s on my mind that I don’t want on my mind any longer. It can make me cry, laugh, dance, and run faster. I’m also thankful for iPods and iTunes to make getting music so much easier! I remember having my radio on, waiting the arrival of my favorite song so I could push the RECORD button and then have that song at my fingertips. Then there was the Walkman, the barbarically sized thing that I hooked to my shorts so I could run with music. How cool was that??? Probably not really cool considering the size of my foamy earphone things. Yikes. Now I have about a billion different songs that I can easily shuffle through while my tiny little earphones stay tucked into my ears. I’m thankful for that. 8) Doctors. To make a long story short, doctors can diagnose and then remove cancer from your mom. They can do CAT scans so you know your sister doesn’t have a brain injury after a bike accident. Besides that, as a runner, it’s nice to know that when you have issues with your various body parts, you can visit a physical therapist or chiropractor to heal said messed up parts. I get chiropractory things done to me and after, I feel all twisted up pretzel-like as if I’ve just gotten out of the dryer. But I’m finally running without pain and so my chiropractor can twist me into a pretzel and then do active release on my shins as much as he wants. 9) Beer & Friends. These things go hand in hand many a time, and I’ve needed them both this year, so I am thankful to both this year. I have amazing friends, and we’ve had some great times drinking beer. 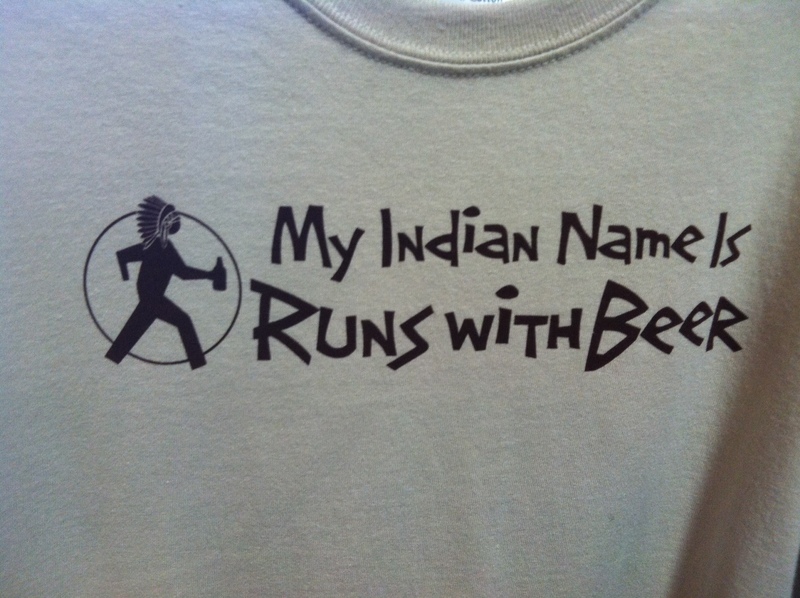 Just as many NOT drinking beer too, so no one send me the link to AA – I’m a responsible marathon runner. My brother-in-law brews beer. My husband brews beer. And what do you get at the end of a lot of races???? Yup, beer. I’m always thankful for that. 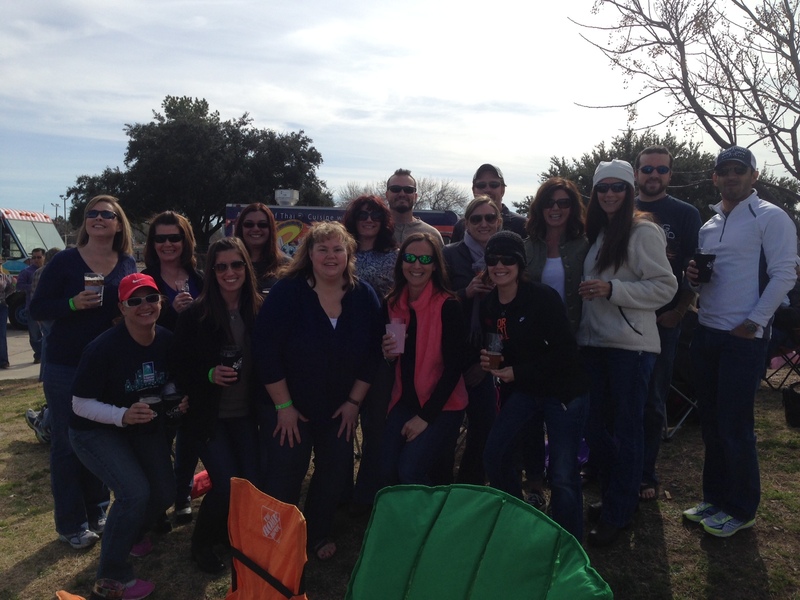 A group of us at No Label Brewery – the perfect mix of beer and friends. 10) Running. Surprise!!! Haha, I’m stating the obvious, but I am SO THANKFUL for running, for the ability to run, and all that running does for me. I’m heading to the Y to run the Gallop for Gravy 5k in the morning, so I get to do my favorite activity on the day I’m most thankful for it. Then I’m going to eat my body weight in mashed potatoes and gravy and probably have a beer.